Cypress is used as an ornamental shrub in landscaping. It has an attractive greenish-blue, scale-like needle foliage. You can maintain a desired size and natural shape for your landscaped cypress shrubs through pruning. The goal for pruning your cypress shrubs should be yearly thinning rather than major thinning that takes place less frequently. It is important to never prune more than 1/3 of the overall branches. Pruning requires skill to achieve a natural appearance and keep the shrub healthy. Take your time and err on the side of caution when pruning. A basic set of pruning shears will help you maintain the appearance of your cypress shrubs. Look over your cypress shrub in early spring just before the new growth is ready to start forming. 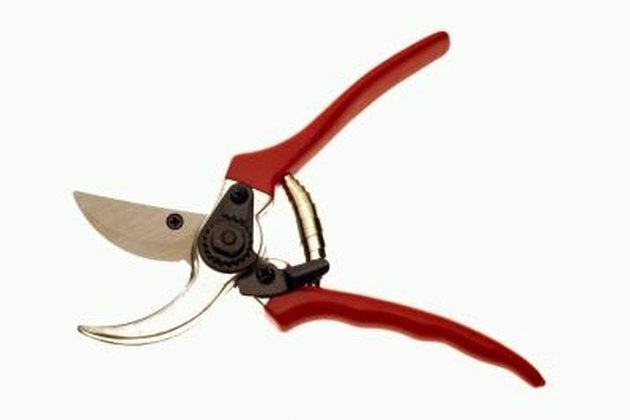 Trim away any damaged or dead branches at the start of the branch where it branches off at a fork or at the base of the shrub depending on where the damage has occurred. Thin out the shrub by working from the underside and trimming with pruning shears so that you make an upward slanted cut. Cut the branches at various depths to keep a more natural appearance. Prune the branches a bit more if desired in spring and early summer as new growth develops. Cut back the branches in the same manner -- at an upward angle. Trim the desired branches back to a branch fork where a new green shoot has begun to grow.